Sixty-one percent of clients who provided referrals did so because they wanted to help a friend of colleague. While I have a specific process I teach to help people acquire new clients through referrals and introductions, there is no one way. There’s no one way to engage with your clients. There’s no one way to ask for referrals. And there’s no one way to get introduced. We’ll call these “referral shades of grey.” While the title is tongue-in-cheek, I hope you find the following 10 “un-commandments of referrals” helpful. (1) Great client service is enough to create referrals. Some people, erroneously, think thatif they serve the heck out of their clients, their clients will give them plenty of referrals. This is actually half-true. We do have to service our clients well — create great value — to become referable. But a 2013 study from Advisor Impact demonstrates that only 20 percent of satisfied clients give referrals. To get abundant referrals, we have to create engaged clients. 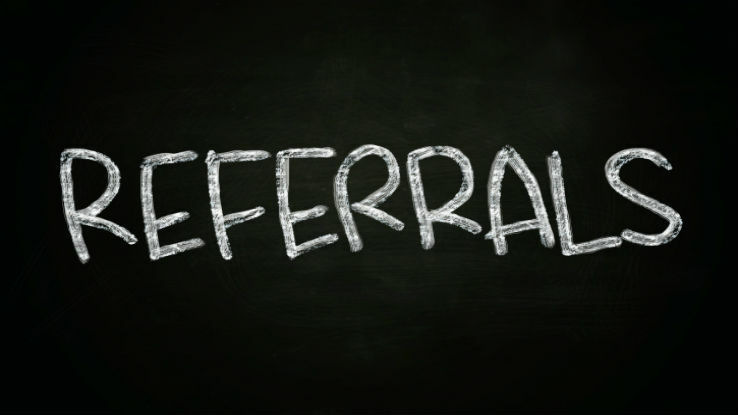 (2) YOU have to be the one to ask for referrals. Generally, the person with the best relationship with the referral source should be the one to ask for referrals. But I’ve seen situations where someone else has done the asking — with some success. My financial advisor, for instance, often brings in his business partner to do the asking. He’s just not comfortable with it (try as I might to help him) and they’ve learned that his partner asking is better than no one asking. (3) You can’t ask for referrals anymore. This is a bad perspective being touted by so-called sales and marketing experts. To quote my high school basketball coach, “Horse Manure!” They are right in the fact that you should not ask for referrals with the old, you-centered methodology. When asking for referrals, it should be from a client-centered perspective — about the value you bring. Second, when speaking with clients, we should be favoring the word “introductions.” After all, what we really want is a good connection to our new prospect. (4) YOU have to be the one to contact the new prospect. It’s definitely more effective to have you make that first contact with the new referral prospect. In most cases, your client is referring you, not someone else on your team. However, it might be enough for you to call (or email) the prospect as the first contact and leave a message, telling them that your assistant will be reaching out to them to set up a phone appointment. (5) You have to ask for referrals in person. It’s always best to ask in person. You can see body language and you usually have more time. Second best is to ask over the phone, which can work nicely if you’re only looking for one specific introduction. Email or LinkedIn is least desirable, but can work if you have a really good relationship with your referral source. Try to do it in person as much as possible. (6) Your first meeting has to be in person. Not at all. I suggest your first “meeting” with a new prospect be a short phone appointment or webcast appointment. Build rapport and value on this short call and your prospect will be more invested in the next appointment. If you aren’t using webcasts for this initial appointment, I urge you to consider this increasingly popular strategy. If can provide great value and a better connection because you have the visual component. And by “visual component” I don’t mean web video. (I hate the way I look with a webcam.) I’m talking about the use of slides or a website. Most people learn faster and remember more visually. (7) You can’t ask for referrals/introductions early in a new relationship. Mostly wrong! I think you should be mindful of your initial process and the personality of your new client. If you have a highly-valuable initial process, you could be becoming referable quickly. If the prospect or client has a very open personality, then they may be very willing and excited to introduce you to others. Don’t assume that you can never ask early. This false assumption will limit your awareness of when you can ask early. (8) You have to take asking for introductions deadly serious. Not quite! I advise you to treat the request with importance – so you come from a place of confidence and they then treat your request with importance. But having fun in the process has proven to be a very effective strategy. Doug is a financial advisor in Omaha. Using my Brainstorm Method, Doug says, “We’re just brainstorming here. First of all, do you know any lottery winners?” His clients laugh. It breaks any possible tension. He gets introductions almost every time he asks for them. (9) Clients will give you referrals to help you. Advisor Impact’s 2014 Study determined that 61 percent of clients who provided referrals did so because they wanted to help a friend of colleague. Nearly 4 in 10 (37 percent) of clients who gave referrals did so to help their advisor. So almost twice as many people give referrals to help someone else. But the desire to help you should not be ignored. And as client engagement increases, clients become increasingly willing and likely to want to help you in addition to helping their friend or colleague. Personally, I think we should endeavor to harness both energies. (10) You don’t need to thank clients for referrals. No, you don’t. But I strongly urge you to do so. It’s not about the money. It’s the gesture of saying, “thank you.” If you have someone who gives you referrals frequently, then you don’t have to send a gift every time, but always keep them in the loop. Let them know you’ve followed up with the prospect and will pursue, appropriately, to its logical conclusion.